Graco’s LubePro A900 pump from MotionSource is a single stroke oil pump to lubricate your machinery quicker, with more consistent pumping technology. Extend your equipment life and improve efficiency without service interruptions. 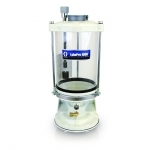 The LubePro A900 pump is a dependable solution for output and constant lubrication cycles. The LubePro A900 is the preferred solution for simple, injector-based automatic lubrication systems. Compatible with compatible with GL-42 and GL-43 injectors, LubePro pumps are a durable, cost effective solution for your automated lubrication systems. With a pressure ratio of 9:1, the A900 delivers a greater output than competitive models at 1.5 in per stroke. Plus, there is no wait like the competition, MotionSource has LubePro A900 pumps in stock and ready to ship today. Simple to install on your existing airline, the pneumatic powered LubePro is engineered with high quality seals built to outperform its competition. LubePro pumps leverage the same proven quality and leading technology as Graco Fireball pumps, proven in the industry for 60 years.